We love to take client ideas and build them into something that exceeds all expectations. Get a free estimate of your ideas by contacting us today. You can call us at (877) 201-3060 or by using the form below anytime. We'll recieve notice the moment you submit the form and we'll contact you as soon as possible. Please provide as much information as you can in the description. The more you describe, the more we'll be ready to meet your needs. We're available over the phone, over online chat, and by email. Our business hours are 9am - 5pm MST but feel free to contact us anytime and we'll get back to you as soon as possible. We're right here in Provo. All of our designers and programmers work in-house at our office in Provo, Utah. 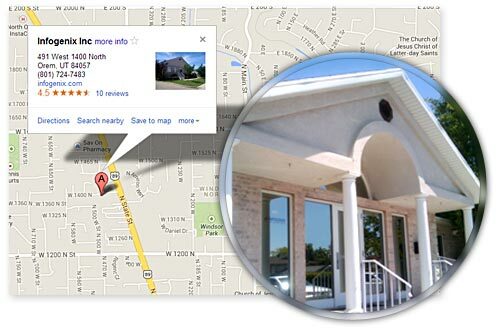 We're located at 5252 N Edgewood Dr Suite #310, in the Riverwoods. Drop by any time between the hours of 9am - 5pm MST and we'd be happy to show you around. We can even give you a face-to-face estimate of your project if you're interested in working with us.